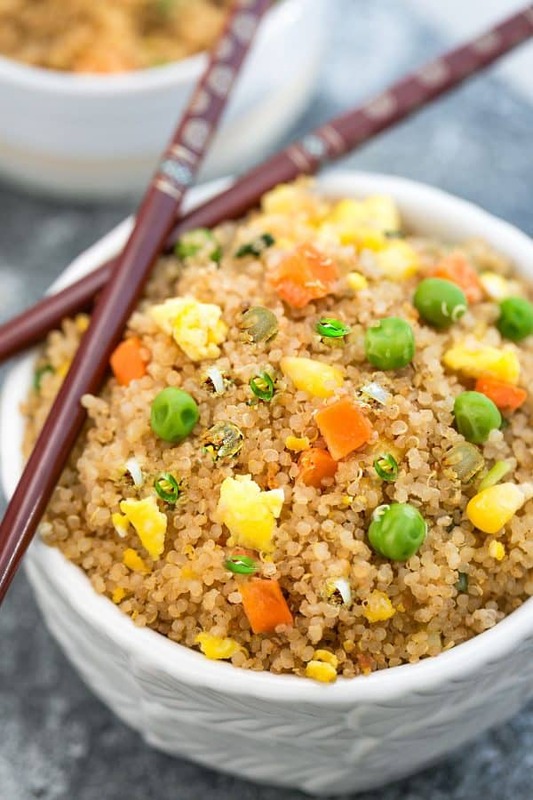 Quinoa Fried Rice is the perfect simple and easy weeknight side dish. Best of all, instructions included to make it in your Instant Pot pressure cooker or on the stove! Fried rice is one of those things that shows up regularly around our house. It’s super simple and you can make it with just about anything you have on hand. Plus it makes the perfect base for cleaning out the fridge with those odds and ends. I am a big quinoa fan, so every so often, I love swapping out the rice for quinoa instead. 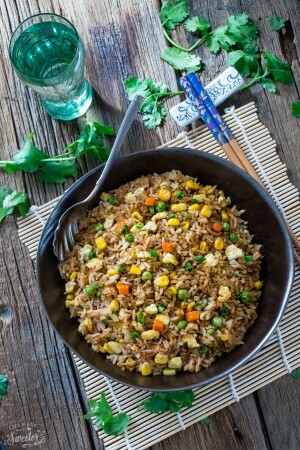 Now I know there are tons of recipes out there for Quinoa “Fried Rice” and today’s recipe is just a variation of my favorite fried rice recipe. Plus, this one has directions for making it on the stove or in an Instant Pot. Do you guys have an Instant Pot? It seems to be all the rage right now. They were kind enough to send me one to test out and you guys!! I am SO in love!! After testng it out for a few months, I’m excited to start sharing more Instant Pot recipes here. 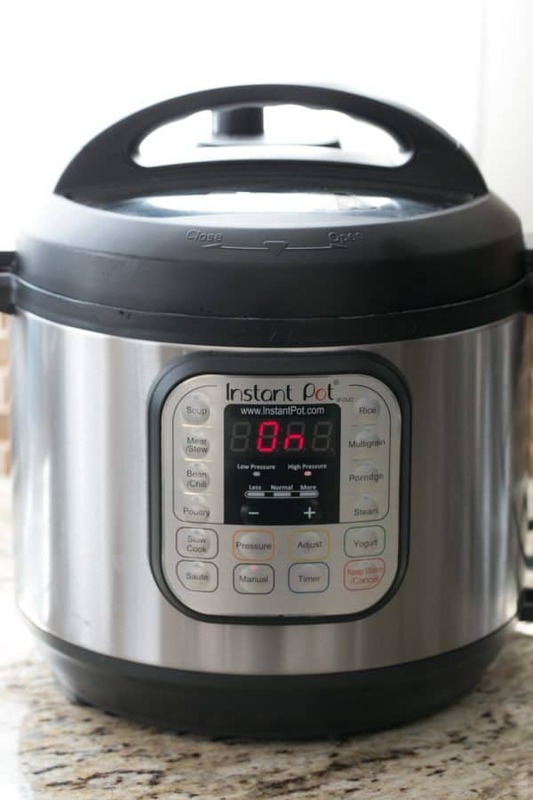 It’s basically a 7-in-1 Multi-Functional Cooker – a pressure Cooker, slow cooker, rice cooker, yogurt maker, steamer and warmer, and it sautés and browns. 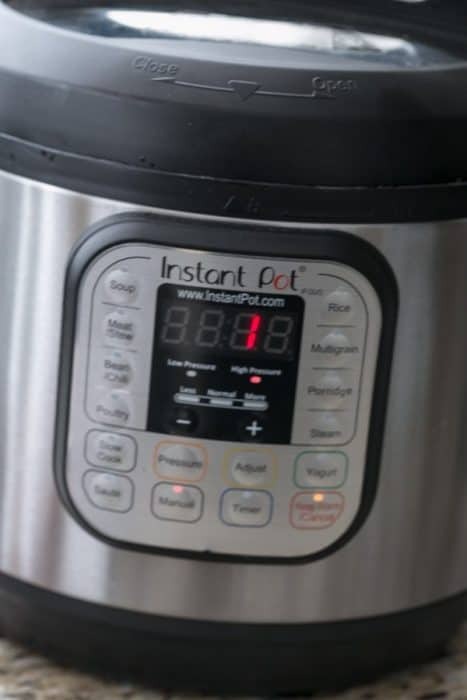 As much as I love my slow cooker, I have to say I am already smitten with all those features about the Instant Pot. I love that you can sauté the food in the same pot prior to slow cooking or using the pressure cooker. I mean it can cook chicken in 25 minutes, which is much faster than a slow cooker. And the best part? You can probably adapt almost any slow cooker recipe and make it in an Instant Pot. Anyway, if you have an Instant Pot and are looking for more recipes to make in it, this Quinoa Fried Rice is an easy recipe to start with. Leftover chilled quinoa would be ideal for this recipe but you can also make it the same day using the Instant Pot. 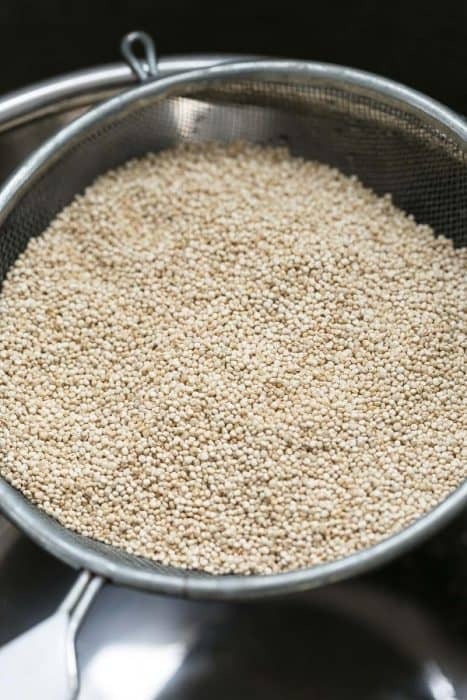 Some quinoa brands have a bitter-tasting coating so I usually like to rinse it under cold running water before cooking it. Use a fine mesh strainer to keep the tiny seeds from falling out while rinsing. 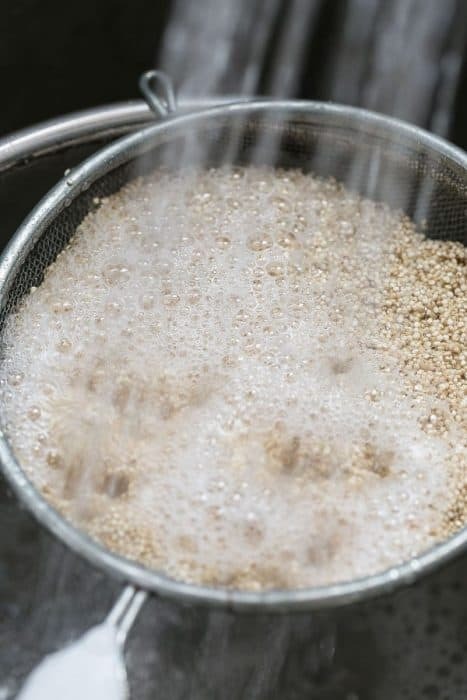 Allow for a natural pressure release of at least 15 minutes, and you’ll have perfect quinoa! 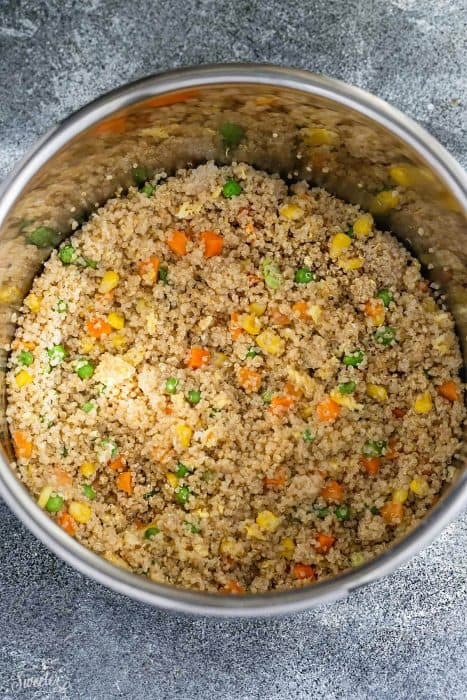 If you plan to make Quinoa Fried Rice on the same day, simply spread the freshly made quinoa out on a baking tray and place it in the freezer for 15 minutes. To get started on the Quinoa Fried Rice, you’ll need to heat the unit up. Just press the SAUTE button and heat up the sesame oil. Add garlic, ginger and onions and cook for about 1-2 minutes, until fragrant. Add the mixed vegetables and cook for another minute. Push all the ingredients to one side and add the beaten egg and stir and scramble for another minute. Stir in the quinoa and other seasonings once the egg is mostly cooked. 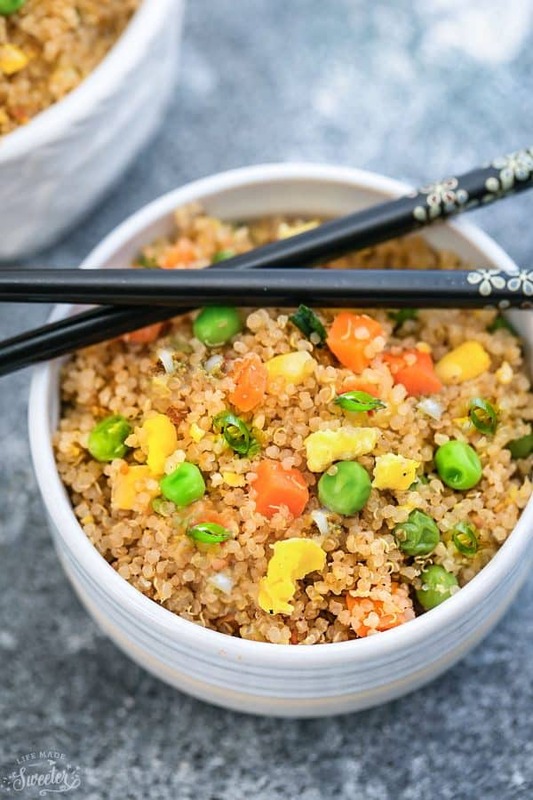 This quinoa fried rice is a healthier alternative to traditional fried rice. It makes a simple side dish or add some diced tofu, chicken, shrimp or any other protein to make it a well rounded, easy and tasty weeknight meal! This is not a sponsored post, but thank you to Instant Pot for sending me product to make this recipe! Heat the pressure cooker on the SAUTE setting. Heat oil and add the onion and garlic. Saute 1 minute. 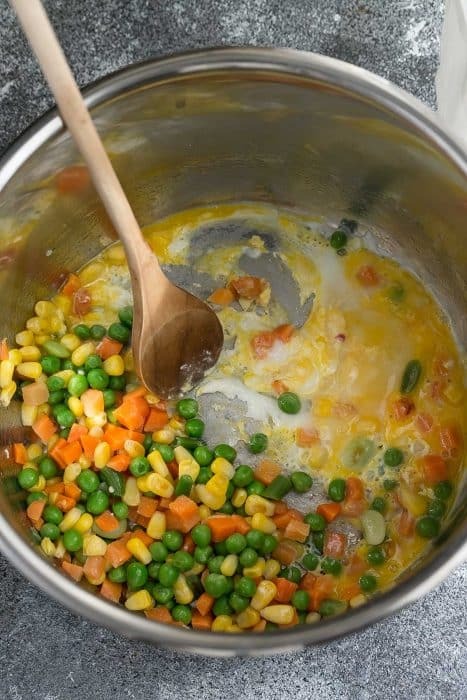 Add the mixed vegetables and cook for 1-2 minutes. Push ingredients to one side and add the beaten egg. Scramble then mix with the rest of the ingredients for 1-2 minutes. Add the quinoa, soy sauce, teriyaki sauce, rice wine and salt and black pepper to taste. Add red hot chili flakes or Sriracha for a kick of heat. Serve hot and sprinkle with sesame seeds and green onions, if desired. Rinse the quinoa and drain. 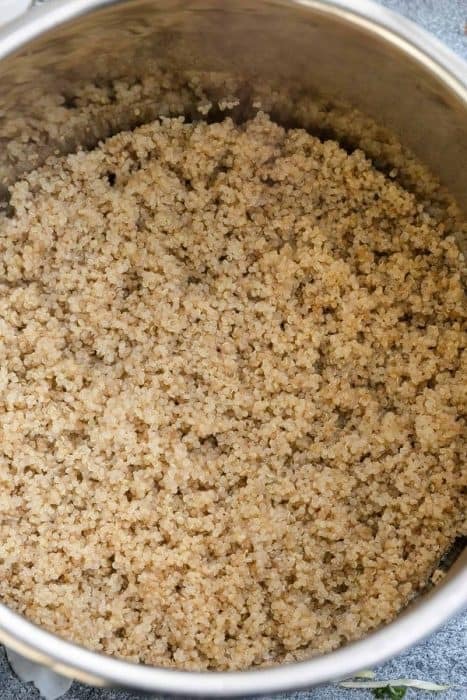 Add the quinoa and water to your Instant Pot insert. Close and lock the lid. 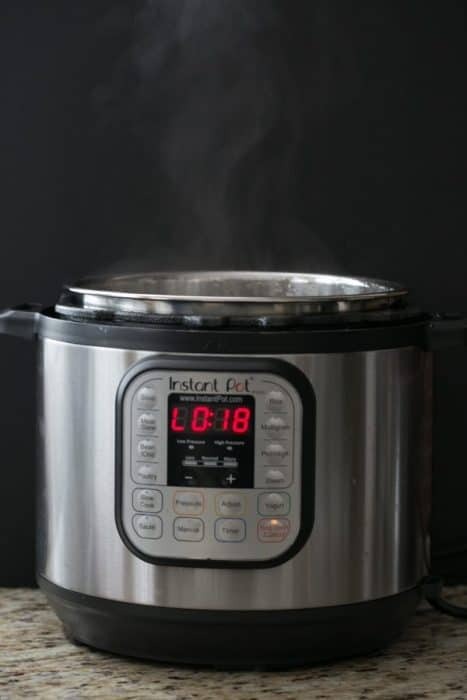 Press [Manual] and then use the [-] button to choose 1 minute of pressure cooking time. When the time is up allow it to release pressure for at least 15 minutes. Release pressure valve, open lid and fluff quinoa. Heat sesame oil on high heat in a non-stick wok or pan until smoky hot. Toss in the onion and garlic and cook for about 10 seconds. Add the mixed vegetables and sauté for another minute. Stir in the quinoa and break up any large chunks with a spatula while tossing until heated through, around 2 minutes. Pour in soy sauce, teriyaki sauce, rice wine, tossing to combine everything evenly. Keep stirring the quinoa until slightly toasted, about 2 minutes. Add salt, black pepper, red chili flakes or even Sriracha to taste.